Pastasaurus Pasta Server - Moar Stuff - You don't need it but you know you want it. This pasta server comes one to a package. The pasta server is made of polypropylene. This pasta server features a dinosaur-shaped head with pasta-snagging teeth. Drain liquid away from your pasta with holes representing the eyes and nostrils. The server is top-rack dishwasher safe. I’ll bet you didn’t know that there was a dinosaur that loved pasta, did you? Discovered in Italy (where else?) the Pastasaurus-Rex was a ravenous beast that would eat all of the pasta it could find. OK, a lot of that was not true. There weren’t any pasta-eating dinosaurs that we know of (mainly because the pasta-maker wouldn’t be invented for 65 million years after they went extinct). 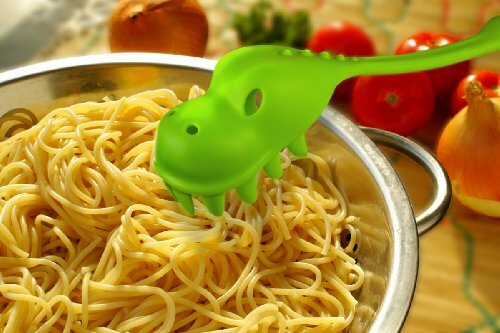 The Pastasaurus Pasta Server, however, is a very real and fun way to serve up your favorite pasta dish. 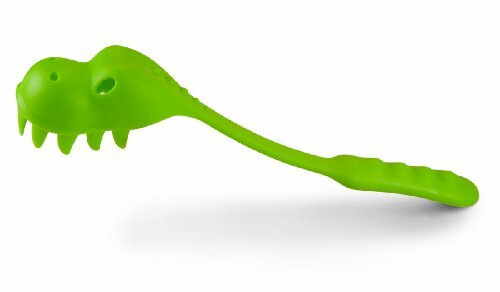 Made from polypropylene, this pasta spoon is shaped like the top of a dinosaur’s skull. The teeth work to snag the pasta while the eye and nose holes let the excess water quickly drain away. When you’re done with your Triassic pasta feeding frenzy, cleanup is easy since it’s top-rack dishwasher safe. If you like this, you might want to look at the Soupasaurus Dinosaur Ladle which would be great for serving up extra sauce. Dimensions: 2.2 x 3.8 x 15 inches. The Pastasaurus didn’t roar. Since it had a nasty overbite, it was more like a “Tffffftttttt”. Contrary to my wife’s opinion, I’m not childish, I’m immature. That means I can adult but, still like dinosaurs.